One of the processes used in the oil and gas industry is called solidification. Water that has a high solid content, or sometimes sludge with a high water content must be treated before it can be disposed of in the landfill. Lime is used to soak up the excess moisture and solidify the waste. One of the problems operators face is getting the lime all over the equipment and tanks. Once the lime gets a little bit of water in it, it's really hard to remove, and it sets up like concrete. For maintenance operations, the procedure is to use either hydrochloric/ muriatic acid or run to the dollar store and get CLR or lime away. Hydrochloric is very unsafe, and the dollar store is very inexpensive and very inconvenient. 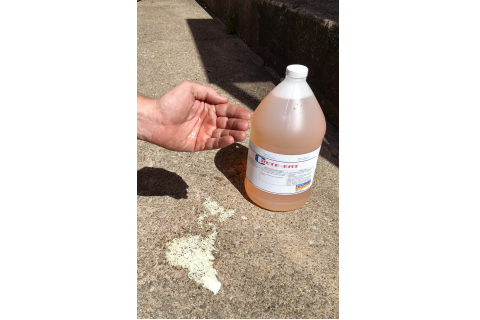 CreteEat etches concrete and dissolves hardened lime. It's safe on skin.